Alleppey (Alappuzha) is a major tourist attraction of Kerala. Read the following article to know more about this enchanting place. Alleppey (Alappuzha) is among the top tourist attractions in Kerala. This beautiful tourist site has a large network of inland canals that give it the name ‘Venice of the East’. The history of the place states that it was founded by the Dewan of Travancore, Raja Kesavadasan in 1762. Initially, the town had only one canal through the strip of sand between the Arabian Sea and Vembanad Lake. With passage of time, the town grew with a huge network of canals that serves as the lifeline of the place. Alleppey has an impressive history of being one of the prime hubs of trade, with one of the renowned ports along the Malabar Coast. Alappuzha is famous for its backwater tourism. Alleppey is world famous for its snake boat races. The most popular snake boat race is the Nehru Trophy Boat Race, which is held on the second Saturday of August, every year. This competition was started by Prime Minister Jawaharlal Nehru in 1952. This exciting event consists of the gigantic boats, each carrying over a hundred oarsmen. The snake boat races are equally popular among the tourists and the local population. A boat cruise along the backwaters of Alleppey provides a brief account of the day to day activities of the inhabitants, such as toddy tapping, fishing, and making of coir, prawn farming and other activities. Ambalapuzha Sree Krishna Temple is located 14 km away from Alappuzha. The traditional style of architecture, native to Kerala, is evident in features of the temple. The temple is renowned for the preparation of ‘Palpayasam’, the sweet milk porridge, which is offered to the presiding deity. Karimadi is a small village situated 3 km east of Ambalapuzha. The village is known for its 9th century black granite statue of the great Buddha, who is also known as Karimadi Kuttan. There are several interesting legends connected to this idol, one of which states that when Dalai Lama visited Kerala in 1965, he worshipped at this shrine. 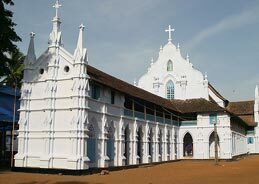 Champakulam village is famous for the St. Mary Church built in 427 A D. This church is quite popular due its beautiful mural paintings. The church is flocked by devotees on the third Sunday of October, when the annual festival is celebrated. Alleppey Beach is fairly large, clean and a very popular beach in Kerala. It is a popular picnic spot. The old pier, which is 137 years old, extends into the sea here. For visitors, there is an old lighthouse. Tourists can indulge themselves in interesting beach activities, such as playing Frisbee and volleyball, along with enjoying camel and pony rides. Also known as the rice bowl of Kerala, Kuttanad is its immensely popular for its extensive paddy cultivation. The beautiful village is situated at the very heart of the backwaters. Kuttanad provides a scenic view of sparkling waterways and the rich crop of banana, cassava and yam. The nearest airport is Cochin International Airport, at a distance of 54km from the city. An excellent network of Southern Railways connects Alleppey to other major cities of South India, such as Cochin, Kozhikode and Chennai. There are regular bus services available from Alappuzha to Cochin, Thiruvananthapuram, Kozhikode, Chennai, Bangalore, Mysore, and Coimbatore. Alleppey is linked with Cochin, Quilon and Kottayam through waterways as well.